Tarbosaurus was found in mongolia, and was given the name T. battar. 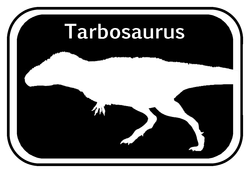 Many scientists think that Tarbosaurus is synonymous to Tyrannosaurus and was only a subspecies living in the different hemisphere. Tarbosaurus was one of the largest Tyrannosaurids and would have taken the similar niche of Tyrannosaurus rex in its ecosystem. A unique difference for Tarbosaurus however, is that it had smaller arms compared to body size than Tyrannosaurus.